"...a technological plateau in current CD playback, employing both contemporary and old-school thinking." CES -- that bazaar of new technology -- is where we members of the press find the products we'll report on in the year that follows. I drive to the show, a luxury that allows me to bring a few choice review products home with me. The big boxes in the back of my minivan have worried the security people at Hoover Dam in the past. This year, I was hauling the latest versions of Zanden's Model 5000 Signature DAC and Model 2000 Premium transport, both of which come in boxes big enough for large amps. As I approached the Dam, I could imagine the questioning. "What's in the boxes, sir?" "A CD player," I'd reply, trying at first to simplify the issue. "There's a CD player in those two big boxes?" "Yes. Well, actually a separate transport and digital-to-analog processor for playing CDs." "The transport spins the disc while the DAC turns the digital data into analog music. Sort of like a computer hard drive and CPU." "Uh huh. Will you please step out of the car, sir?" But I was fortunate -- waved through the checkpoint without a word. The next day I unpacked the Zanden DAC and transport, knowing that both had been upgraded. I thought I might see some outward sign. Nope -- just the same chrome, acrylic and brushed golden-hued aluminum I had always known. A few weeks later, I traded e-mail with Eric Pheils, Zanden's US distributor. Eric is based in Japan, where he can be the greatest help to Kazutoshi Yamada, the design mind behind the complete line of Zanden electronics, who lives in Osaka-City. Eric filled me in on the changes. For the 2000P, the crystal oscillator -- the transport's word clock -- was upgraded to a custom-built number with greater temperature stability and a frequency to match that of the Philips CDM12 Pro2 transport mechanism used. "Normally, such high-quality oscillators are built for industrial and scientific purposes with a standard 10MHz frequency," Pheils told me. "However, all CD transport mechanisms require some multiple of the CDs 44.1kHz sampling frequency to work." The Philips mechanism that Zanden uses requires 8.4672MHz, which is the new crystal oscillator's frequency.
. Removing it greatly improved the sound. It was also one of the reasons we selected a crystal oscillator over rubidium, which would have required the DDS." The Model 2000 Premium's power supply was upgraded as well -- and simplified due to the elimination of the DDS. Here, Mr. Yamada increased the amount of noise-absorption materials -- the Safety Wave fabric he has used in the past -- and he implemented a "proprietary manufacturing technique" that is said to ensure "the best sound quality." Yes, this last point is vague, but like most audio designers, Mr. Yamada is guarded about some of the things he's doing that are unique to his products. The Model 5000 Signature has completely new circuit boards in the main unit, and the circuit boards in the separate shoebox-shaped power supply now have gold plating. The power supply is now "in line with that of the 2000 Premium." As with the 2000 Premium, Mr. Yamada incorporated more noise-absorption material in the latest 5000 Signature and employed his proprietary manufacturing technique. Zanden will not be making an official model change because of these upgrades, which do seem rather extensive. Why not? I would bet that Mr. Yamada has been criticized for all of the earlier model changes and wanted to avoid more of the same. We first reviewed the Model 5000 DAC in 2002, when it was the 5000 Mk II, and have written about the Mk III and Mk IV versions in addition to the Signature. If you have an older Model 5000 Signature and 2000 Premium, Zanden can bring them up to current snuff. The cost is $3500 and $4500 respectively. Even with the weak dollar, the retail price of Model 2000 Premium remains unchanged, $27,970 USD, while the Model 5000 Signature has increased $500 to $15,970. The latest Zanden digital duo retains the innovative design features of earlier versions. The DAC uses tubes -- a single 6922, 6DJ8 or 7308 in its output stage (an NOS 7308 now comes installed), and two 6CA4s along with a single 6X4 in its tube-rectified power supply. The out-of-production Philips TDA-1541A Double Crown DAC chips, which cannot decode any upsampled data, and proprietary analog filter also remain. The Model 2000 Premium keeps its a highly accurate word clock, although, as I've mentioned, it's not the same one used in the earlier version of the transport. For best sound, the 5000 Signature and 2000 Premium connect via an included I2S cable, which addresses jitter, or timing errors, that harms the sound of digital separates. Instead of the word clock being embedded within the digital data sent along the S/PDIF or AES/EBU output-input scheme, I2S carries it on a separate pathway, so the DAC doesn't have to recover it from the data stream. Another advantage is a matter of addition by subtraction: When connected via I2S, the transport and DAC don't use S/PDIF or AES/EBU transmit and receive circuitry, which can introduce jitter. The sound of Zanden digital separates has always been about beauty, with each new version of the DAC, and now the transport, addressing truth to a greater degree. I praised the previous Model 5000 Signature and Model 2000 Premium for sounding like "a top-flight analog rig -- the easy resolution, the lack of a hard, analytical character that has historically plagued much digital playback." There is nothing new in this regard with the latest Zanden DAC and transport; their analog-like presentation is obvious and lacking in mushiness or opacity, the bugaboos of digital that tries to sound like analog. What Mr. Yamada has accomplished isn't mere imitation. I am convinced that the Model 5000 Signature and Model 2000 Premium could pass for a turntable in a blind listening test -- though the missing ticks and pops might give things away. The Model 5000 Signature and 2000 Premium differentiate recordings, exposing their unique sonic signatures, very well, and never obscure detail in favor of an easy-on-the-ears disposition. The full, sweet sound of JVC XRCDs is as obvious as the leaner, dryer character of Blue Note's RVG remasters. Piano is especially well served -- as it is with so many of the products I admire. Notes become events, with distinct attack and decay, but they are not isolated from each other and disconnected from the organic flow of the music. Still, I am convinced that some listeners who are used to sound that's more pyrotechnic and attention-grabbing will wonder what's so remarkable about the Zanden separates. To my ears, they define "remarkable" precisely because nothing about their sound leaps out. Instrumental timbres are natural and true, and the perspective is neither forward nor recessed. All of this leads to the sort of presentation that appeals on a level below analysis, and one I never tire of, even with other CD players, DACs and transports waiting in the wings. How do the newest DAC and transport compare to the versions they replaced? I can't say for sure -- I didn't have old and new separates on hand for direct comparison, and I hadn't listened to the older products for almost a year. But in the meantime I listened extensively to a great deal of top-shelf digital, including the Esoteric P-03/D-03 combo, the Audio Research Reference CD7 CD player, the Ayre C-5xe universal player, and the Aurum Acoustics CDP preamp/CD player -- all sonically different, and all very, very good. What I can say with surety is this: The Model 2000 Premium and Model 5000 Signature are my favorite way to play CDs right now, even taking into account the improvement that the products from Esoteric, Audio Research and Ayre realize when they are used balanced. Something I wrote in my earlier Zanden review still holds true: "I am aware of no better digital source." 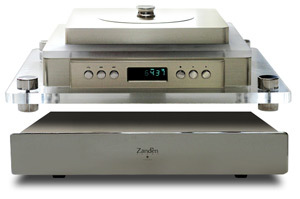 From now on, when questioned about the Zanden Model 5000 Signature and Model 2000 Premium, I have a suitably impressive-sounding response: They represent a technological plateau in current CD playback, employing both contemporary and old-school thinking. They cost a shade under $44,000 and comprise the best CD player I've ever heard. All that should explain those big boxes. Prices: Model 5000 Signature DAC, $15,970 USD; Model 2000 Premium transport, $27,970.